Because none of the top 10 women's seeds reached the Wimbledon quarterfinals, surprise finalists will meet on Saturday, right? Actually, the title match will have a familiar feel with Serena Williams facing Angelique Kerber in a matchup of former world No. 1s. Each player lost only six games in today's semifinals. Williams, seeded No. 25, dispatched No. 13 Julia Goerges, playing in her first major semifinal, 6-2, 6-4. No. 11 Kerber dismissed No. 12 Jelena Ostapenko 6-3, 6-3. Williams, who will turn 37 in September, and Kerber, a 30-year-old left-hander, reached their first Grand Slam final since winning the 2017 Australian Open and 2016 U.S. Open, respectively. Williams is playing only her fourth singles tournament since having her first child on Sept. 1. She can tie Margaret Court's record of 24 major singles titles. 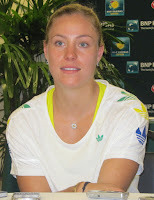 Kerber inevitably suffered a letdown last year, failing to reach the quarterfinals in a Grand Slam tournament, after advancing to three major finals in 2016 and winning two. Williams is 6-2 against Kerber, with the last three matches coming in finals. Williams won 7-5, 6-3 at Wimbledon in 2016 in their most recent encounter, Kerber prevailed 6-4, 3-6, 6-4 in that year's Australian Open for her first major crown, and Williams triumphed 7-6 (1), 6-3 in the 2014 Bank of the West Classic at Stanford. Williams plans to compete in the Mubadala Silicon Valley Classic, which replaces the Bank of the West, on July 30-Aug. 5 at San Jose State. Kerber, however, is not entered in the tournament. In the men's doubles semifinals, No. 7 seeds Mike Bryan (Stanford 1997-98) and Jack Sock held off No. 5 Dominic Inglot of Great Britain and Franko Skugor of Croatia 6-3, 6-1, 6-7 (11), 6-7 (4), 6-4. Bryan seeks his first Grand Slam men's doubles title since the 2014 U.S. Open and his fourth at Wimbledon. He is playing without his 40-year-old twin Bob (Stanford, 1997-98), who's sidelined with a hip injury, at the All England Club this year for the first time. Mike Bryan will return to No. 1 in doubles on Monday, when he will be 40 years, 78 days old. He will become the oldest man to achieve that distinction, breaking the record of Daniel Nestor, who was 40 years, 5 days old when he was last No. 1 on Sept. 9, 2012. Sock hopes to win his second Wimbledon men's doubles title. He and Vasek Pospisil of Canada took the 2014 crown. Mike Bryan and Sock will play No. 13 seeds Raven Klaasen of South Africa and Michael Venus of New Zealand. Klaasen and Venus beat unseeded Frederik Nielsen of Denmark and Joe Salisbury of Great Britain 7-6 (6), 3-6, 6-3, 6-4. In 2012, Nielsen and Jonathan Marray of Great Britain became the only wild cards to win the Wimbledon men's doubles title. Nielsen also captured the 2015 Tiburon and Fairfield Challenger crowns in Northern California with Johan Brunstrom of Sweden. Salisbury and countryman Brydan Klein won the doubles title in Stockton last fall. The Wimbledon men's singles semifinals are set for Friday. No. 8 seed Kevin Anderson, 6-foot-8 (2.03 meters), will meet No. 9 John Isner, 6-foot-10 (2.08 meters), at 5 a.m. California time, followed by No. 2 Rafael Nadal against No. 12 Novak Djokovic. ESPN will televise the matches.